It’s been 50 years since the National Hockey League had only six teams. The years from 1942 to 1967 is known as the Original Six Era — the Boston Bruins, Chicago Blackhawks, Detriot Red Wings, Montreal Canadiens, New York Rangers and the Toronto Maple Leafs were the only teams in the NHL. The NHL added the ‘Second Six’ to boost the league numbers to 12 teams. The decision is one of the largest expansions in professional sports history. The California Seals (later known as the Oakland Seals and then the California Golden Seals), Los Angeles Kings, Minnesota North Stars, Philadelphia Flyers, Pittsburgh Penguins and the St. Louis Blues started the 1967 NHL season. The official day of the franchise awarding was Feb. 9, 1966. Unlike the people of Ottawa who campaigned long and hard for the return of the Senators, St. Louis didn’t even have an owner. The geographical location of St. Louis was the reason for the city’s selection. Of course, the good news would come with a catch because someone had to step up with $2 million to secure the team. They only had until April 5 to do it. Insurance executives Sid Salomon Jr. and his son, Sid Salomon III, were willing to pay. Not only did they put up the security fee, they went on to purchase the St. Louis Arena for $4 million and spent another $2.5 million just to renovate the building. The result was accommodations for 18,000 fans, instead of the original 14,200. And what exactly was the name of that song by W.C Handy? St. Louis Blues. The emblem of the team is the Blue Note, which was taken from the music scale. The Blue Note was updated over the years but it remains a St. Louis tradition. It was Oct. 6, 1967, when the Blues hit the ice for their first game against the Minnesota North Stars. 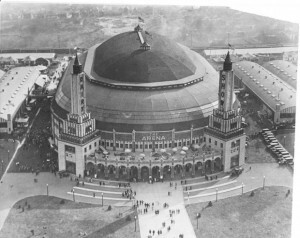 They played to a 2-2 tie at the St. Louis Arena. The team struggled under the helm of Lynn Patrick and the coaching reigns were handed over to Scotty Bowman. The position would be Bowman’s first head coaching job in the NHL and the Blues not only made the playoffs in their first season, they would appear in the Stanley Cup Final. The Canadiens bested the Blues in all four games of the final series. 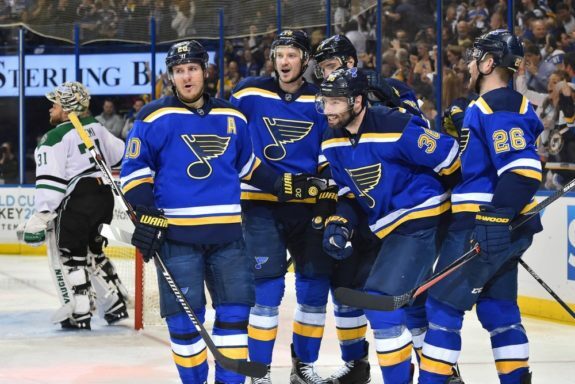 It didn’t seem to hurt the Blues, as they reached the Stanley Cup Final in the next two seasons. Unfortunately, the team has yet to win the Stanley Cup in their 50 years of NHL existence. This is despite the fact that the Blues were successful of making the playoffs with consecutive berths from 1979-2004. It was May 12, 1986, when one of the greatest comebacks in the team’s history happened when the Blues did not want their season to be over. They were down 5-2 to the Calgary Flames in Game 6 of the Campbell Conference Finals (eventually Western Conference). The game had 12 minutes left and the Blues season would be over. Brian Sutter scored for the Blues and Greg Paslawski netted two goals late in the game to force overtime. Doug Wickenheiser was the star of the night as he managed the game-winning goal in the extra session to force a Game 7. The Blues fell in the decisive game, 2-1, as the Flames advanced to the Stanley Cup Final. There have been 24 coaches throughout the history of the Blues. Current head coach Ken Hitchcock stands with the second-longest term behind the bench with 408 games (and counting). 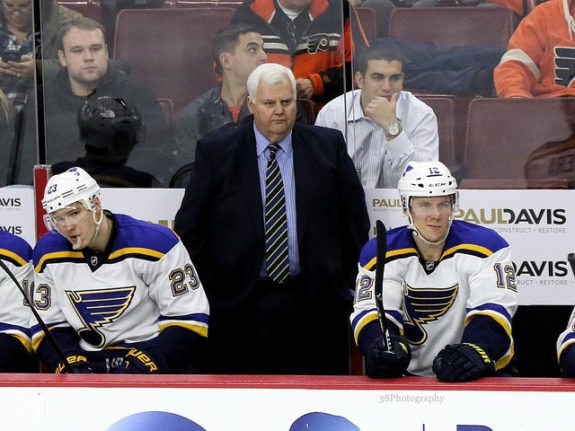 Joel Quenneville leads the way with 593 games on the Blues’ bench. The coaches to clock more then 200 games are Andy Murray, Brian Sutter, Jacques Demers, Red Berenson and Bowman. The team has featured a string of talent through the years from old-timers like Dickie Moore, Doug Harvey, Glenn Hall and Jacques Plante. There’s Bernie Federko, Brett Hull, even Wayne Gretzky, but just for 18 games, and Barclay, Bob and Billy Plager. The Blues retired Barclay’s No. 8 in 1981 and would honour Bob. In 2006, Hull’s number got retired and Federko’s was previously retired in 1991. Al MacInnis, Bob Gasoff and Brian Sutter had the distinguished honour of a number retired by the organization. Overtime hero Wickenheiser was honoured by the team as was announcer Dan Kelly, who did the commentary on the Blues games for more than 20 years. The Blues decided Red Berenson, Garry Unger, Joe Mullen and Keith Tkachuk were the best players in team history to wear the No. 7 and they were honored for their achievements. After 50 years, there are plenty of stories about the Blues. In 2012, they were bought by an all-local group led by Tom Stillman. The group has various business and civic leaders and Doug Armstrong has filled various roles, including general manager since 2013. In the 1999-2000 season, the Blues were able to win the President’s Trophy, which was the first in the history of the franchise. While the team celebrates the past with some fun promotions — Bobby Hull bobbleheads for one — the team will also look ahead. As of Jan. 18, the St. Louis Blues sit in a playoff position with a record of 23-17-5. The hunt for the Stanley Cup still continues.